A Vintage Sewing Give-Away!! times 2!! One week from today I am opening an Etsy shop!! My BFF Beth will be opening her new Etsy shop at the same time!! Beth and I share everything, we are just two peas in a pod! To celebrate our tandem Grand Openings we are each hosting a VINTAGE SEWING GIVEAWAY!! My giveaway is pink and yellow themed and Beth’s is green and aqua themed. To enter the drawing for MY giveaway, leave a comment to this journal entry between today, July 1 and Saturday, July 7. The winner will be announced on Sunday, July 8 to coincide with the opening of my Etsy Shop. 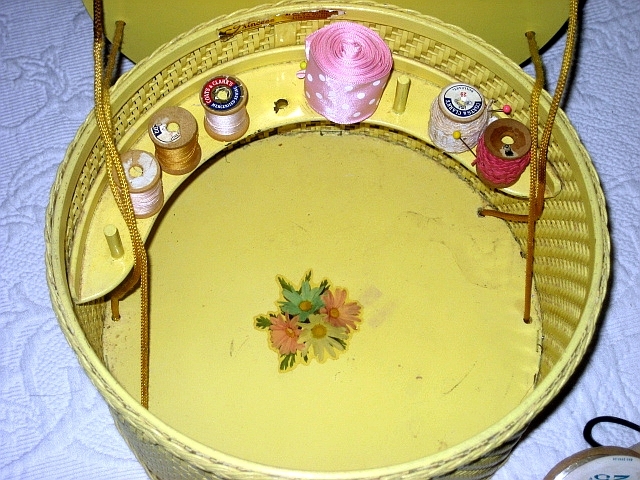 I have filled this vintage wicker sewing basket FULL of vintage sewing goodies! 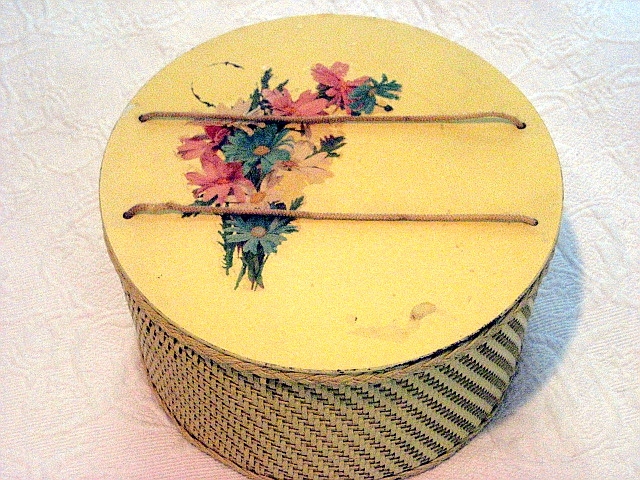 This pretty yellow sewing box has floral decals on top and inside. I’ve thrown in old buttons filling up a pretty swankie swig, yoyo’s, cute pin cushion, appliques, hankies and assorted vintage notions. 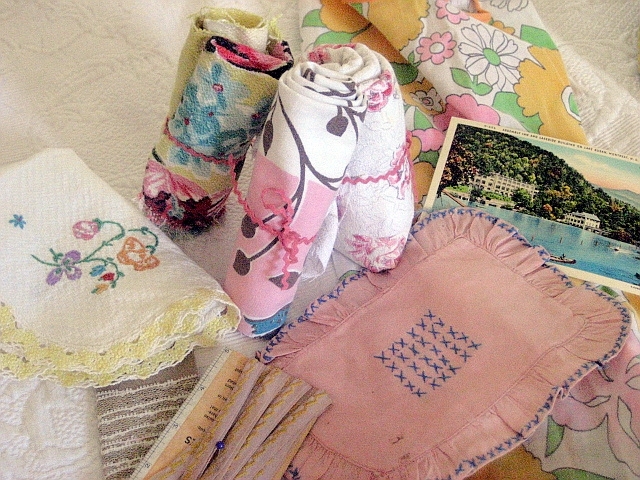 Vintage patterns, trim on old spools, vintage fabric scraps, old embroidered pieces, and lots more tucked down inside. I see a groovy vintage apron peeking through all the fabrics! 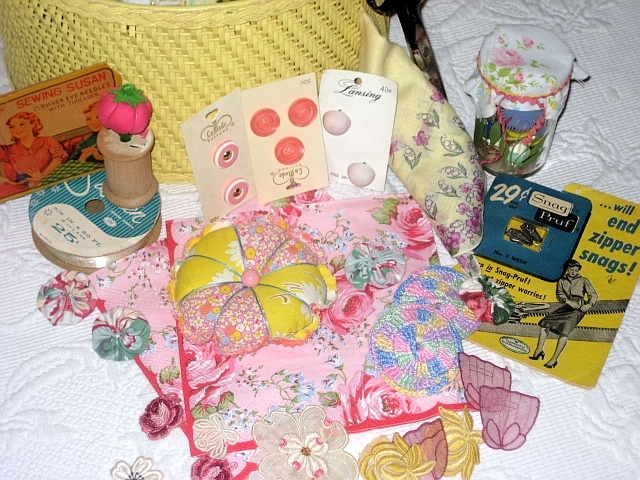 Here is a look at the goodies stashed inside the sewing box. Please leave a comment if you would like to share all my goodies. Jump on over to Beth’s blog and leave a comment there to register for her giveaway too! Wow! Fantastic giveaway! Your blog is a great read and full of fun eye candy too. Please enter me in the drawing and best of luck on your etsy shop launch! Yum. I could just look and look at the goodies in that basket. Please enter me for that! Congratulations on your new shop. Can’t wait to see what charming things you will be filling it with! Following Beth’s link to you and coming over to enter the give away. Of course now that I’ve discovered your blog I’m going to have to go have a look around. Wonderful of you to do this and good luck to both you and Beth with Etsy. I just can’t wait to see your Etsy shop – you make such adorable things! 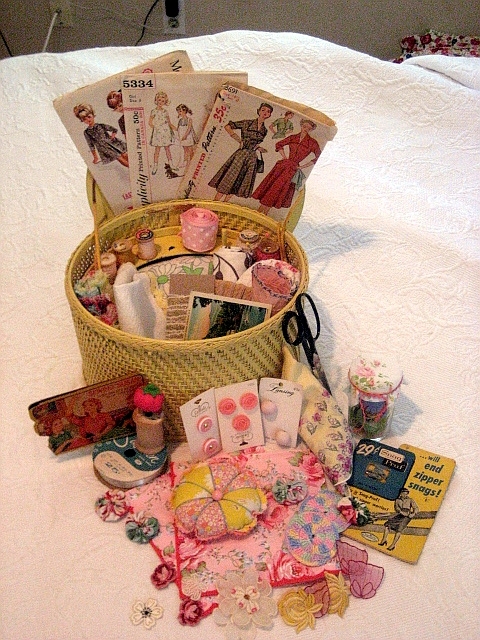 This basket is TOO sweet – love all the vintage goodies you’ve assembled in there, what a fun idea! I am so happy for both of you!!! I seriously can’t wait to see your beautiful bags and whatever other treasures you’ll be cooking up! Hi sign me up pretty pretty please with sugar on top. 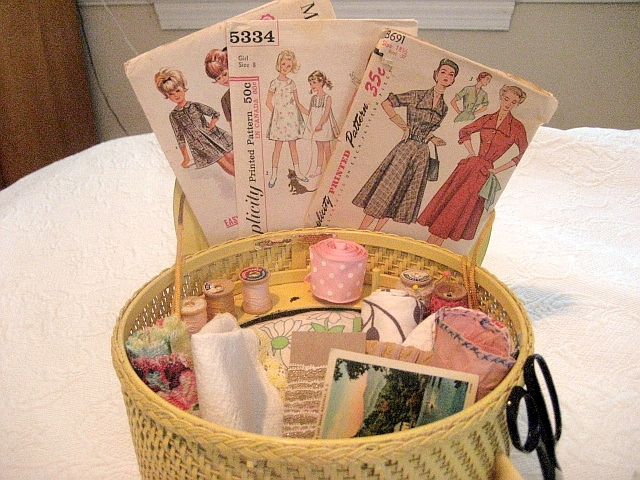 Love them vintage sewing items and love that basket.